Step #6 elicited some laughter from my house and motivated my son to take some video with his phone. 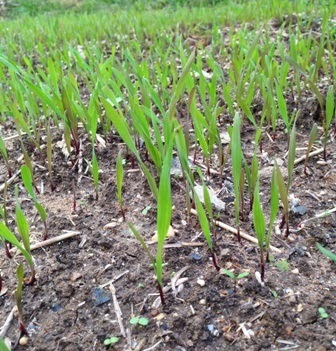 You see to efficiently and forcefully step on the maximum number of seeds I have to do a kind of cover crop dance (not sharing the video). 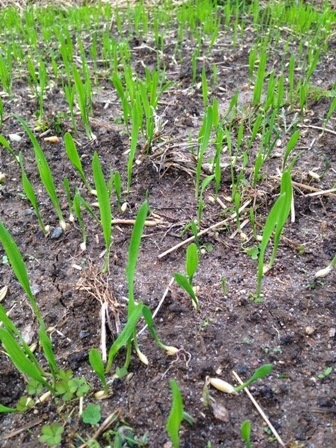 I still felt there was a good chance that the rain would wash seeds to the low end of the beds. I was happily surprised to see that the lazy gardener method worked. I ended up with a good, even stand in each bed. 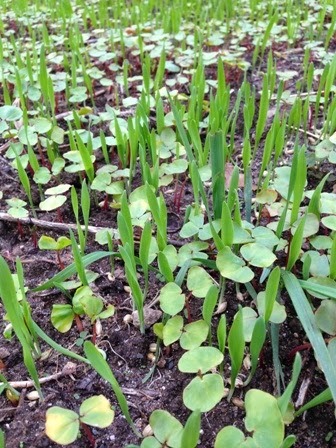 The photo at top shows the emergence of a small bonus crop of buckwheat that re-seeded from a summer sowing. So, let me get this straight, after loosening the soil and broadcasting the cover crop, you walked on the bed to compact the soil? Anyway, I think the Maryland Master Gardeners need to take a collection to bribe John's son for the video so that we can post it on YouTube. 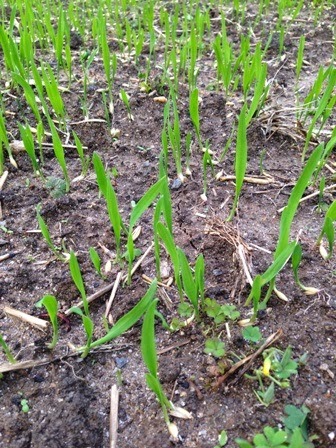 Walking is ok but a small step jig pushes down on the seed and soil with more force. The soil organic matter level is fairly high so I don't worry too much about compaction. Clever you! I never thought of bribes, Kent. I was planning on pleading with Jon to share the video. If we go the bribery route, we just want to be careful not to start a bidding war between Jon and his son.